The conceptual and multifaceted composer/conductor Tan Dun has made an indelible mark on the world’s music scene with a creative repertoire that spans the boundaries of classical music, multimedia performance, and Eastern and Western traditions. A winner of today’s most prestigious honors including the Grammy Award, Oscar/Academy Award, Grawemeyer Award for classical composition, Musical America’s "Composer of The Year," Bach Prize of the City of Hamburg and Moscow’s Shostakovich Award, Tan Dun’s music has been played throughout the world by leading orchestras, opera houses, international festivals, and on the radio and television. As a conductor, Tan Dun has led the world’s most renowned orchestras, including the Royal Concertgebouw Orchestra, London Symphony Orchestra, New York Philharmonic, Berliner Philharmoniker, Philadelphia Orchestra, Orchestre National de France, BBC Symphony Orchestra, Filharmonica della Scala, Münchner Philharmoniker and the Santa Cecilia Orchestra, among others. In 2010, Tan Dun served as "Cultural Ambassador to the World" for World EXPO Shanghai. Most recently, his dedicated work was celebrated when UNESCO appointed Tan Dun as its global Goodwill Ambassador. The inauguration took place at UNESCO’s headquarters in Paris on World Water Day (March 2013) and featured a free public performance of Tan Dun’s own music by the Netherlands Symphony Orchestra. Tan Dun's individual voice has been heard by wide audiences. His first Internet Symphony, which was commissioned by Google and YouTube, has reached over 15 million people online. His Organic Music Trilogy of Water, Paper and Ceramic Concerti has frequented major concert halls and festivals. Paper Concerto was premiered with the Los Angeles Philharmonic at the opening of the Walt Disney Hall. His multimedia work, The Map, premiered by Yo-Yo Ma and the Boston Symphony Orchestra, has toured more than 30 countries worldwide. Its manuscript has been included in the Carnegie Hall Composers Gallery. The Gate (Orchestral Theatre IV) was premiered by Japan's NHK Symphony Orchestra and crosses the cultural boundaries of Peking Opera, Western Opera and puppet theatre traditions. Other important premieres include Four Secret Roads of Marco Polo for the Berlin Philharmonic and Piano Concerto: The Fire for Lang Lang and the New York Philharmonic. Tan Dun was commissioned by the International Olympic Committee (IOC) to write the Logo Music and Award Ceremony Music for the Beijing 2008 Olympic Games. Tan Dun's Percussion Concerto: The Tears of Nature for soloist Martin Grubinger premiered in 2012 with the NDR Symphony Orchestra. Then Nu Shu: The Secret Songs of Women, a harp concerto inspired by the secret Nushu calligraphy of Tan Dun’s home province of Hunan, China was commissioned by the Philadelphia Orchestra, NHK Symphony Orchestra and the Concertgebouw Orchestra for its premiere in 2013. For Tan Dun the marriage of composition and inspiration have always peaked in his operatic creations. His 1995 Marco Polo was commissioned by the Edinburgh Festival and has had four different productions including, most prominently, one with De Nederlandse Opera directed by Pierre Audi. The First Emperor with Plácido Domingo in the title role, is Tan Dun's 2006 opera commissioned by the Metropolitan Opera of New York. Tea: A Mirror of Soul, his opera from 2002 that premiered at Japan’s Suntory Hall, has since had new productions with Opera de Lyon, a co-production by Santa Fe Opera and The Opera Company of Philadelphia. Then his 1998 opera Peony Pavilion, directed by Peter Sellars, has had over 50 performances at major festivals in Vienna, Paris, London and Rome. Tan Dun records for Sony Classical, Deutsche Grammophon, Naxos, EMI and Opus Arte. 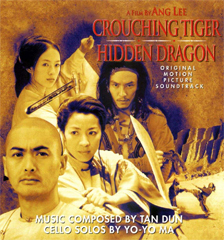 His recordings have garnered many accolades, including a Grammy Award ("Crouching Tiger, Hidden Dragon" soundtrack) and nominations (The First Emperor; Marco Polo), Japan’s Recording Academy Awards for Best Contemporary Music CD (Water Passion after St. Matthew) and the BBC’s Best Orchestral Album (Death and Fire).